Its original height of 340m was reduced to just 110m in the disaster, but further eruptions have since begun to re-model the remnant structure. 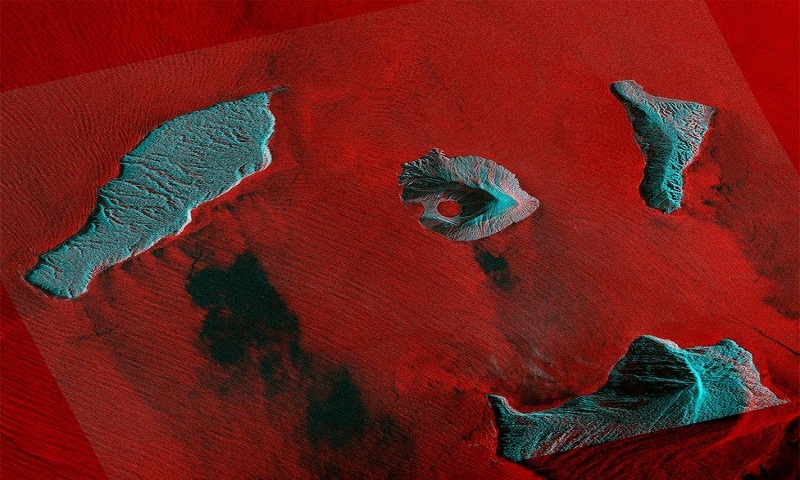 "This image indicates the edifice is in a building phase, with the crater no longer connected to the sea as it was in images from a week or so ago," observed Prof Andy Hooper from Leeds University, UK. More than 400 people died along the coastlines of Java and Sumatra in the Sunda Strait when the tsunami hit. Scientists relied heavily on radar satellites in the days immediately after the collapse to try to understand what had happened. Radar will see the ground day or night, and will even pierce thick cloud. Researchers were fortunate that the European Union's Sentinel platform passed overhead just hours after the event. But such observations are not always so timely. Helsinki-based ICEYE hopes to remedy this by putting up a constellation of small radar satellites. ICEYE-X2 is the second spacecraft to be launched. Another five to eight will go up this year. All these platforms are about the size of a suitcase - far smaller than the traditional radar sensors placed in orbit. The image at the top of this page is cropped and compressed, but the original data generates a resolution of 3m by 3m (features larger than this on the ground can be discerned). ICEYE wants to couple this sharp vision with high temporal resolution, meaning a single spot on the Earth's surface could be surveyed multiple times a day. A constellation of 30 in-orbit platforms could observe mid-latitude locations, such as London or Paris, say, about 15 times a day. Indonesia says it will double the size of its disaster relief budget, following its deadliest year for natural disasters in a decade. In addition to the event on 22 December, an earthquake and tsunami cost the lives of more than 2,000 people on Sulawesi island in September. The Indonesian finance ministry says $750m will be reserved for immediate post-disaster responses, while another $350m will be reserved for reconstruction efforts.